Massage is a deeply relaxing therapeutic treatment that harmonises the mind and body and releases stress and tension. Massaging various parts of the body will impart instant relaxation to the area being soothed and manipulated. Indian Head Massage however, concentrates on easing tension from the head, neck, upper back, shoulders, and in some cases also the arms. Based on the Indian ancient system of medicine, which is known as Ayurveda, this form of massage has been practiced for thousands of years. Ayurveda is regarded as being one of the world’s oldest healing systems, and its approach to health is all about the balance between body, mind and spirit. Because of the specific area of the body that it treats Indian Head Massage is accepted as a complete stress management treatment. 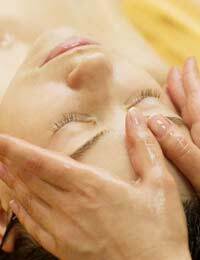 Indian Head Massage is a quick and highly effective form of therapy. The massage can be performed through light clothing and essential oils can also be incorporated into the relaxing and stimulating treatment. Although the stroking, plucking and circular pressure techniques are applied to the head, neck, shoulders and upper arms, collectively this form of massage represents a total de-stressing programme that harmonises the whole body. The strokes also stimulate hair growth and improve condition. Indian Head Massage offers many physiological and psychological benefits and can balance the body as a whole. The techniques increase blood and lympathic flow to the head, neck and shoulders, which improves circulation and stimulates immunity and the elimination of waste products and toxins. The massage deeply relaxes muscles and nerve fibres and stimulates the release of endorphins. Pain and discomfort can be reduced, posture can be improved and tension, aches and pressure can be dramatically relieved. Stress can also be successfully managed by applying the rhythmic effleurage and petrissage techniques and movements on a regular basis. Similar to the acupressure points used in Chinese medicine, pressure points provide a vital channel for energy. Manipulating the pressure points located in the head will balance energy levels and promote good health by stimulating the brain and other parts of the body all at once. Pressure point massage can clear congestion, relieve sinus pain and pressure from tense muscles, increase circulation to the area and restore energy balance. Marma points are subtle pressure points that stimulate the life force. These are located anatomically throughout the body, and there are 107 in total. Thirty-seven marma points are located in the head alone and these are sensitive points that are treated by applying gentle finger tip pressure. Stimulation of the marmas can treat a specific organ of the body or treat an imbalance of some sort. In order to maintain balance and reduce stress, tension and discomfort Indian Head Massage treatments provide an ideal, and convenient, method of treating the whole body. Besides eliminating stress the massage will also encourage improved sleep patterns and increased energy. Regular massage – in a course of treatments – is recommended to maintain the body’s natural balance and harmony.